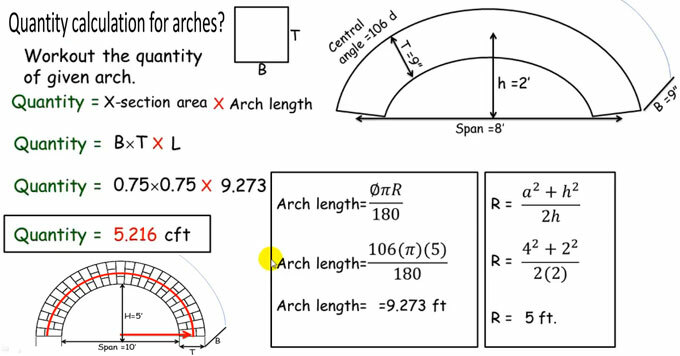 Go through this useful construction video tutorial to learn how to estimate the quantity for different types of arches like semi circular arch, full circular arch and segmental arches. Types of arches are dependent on various factors like shape, material of construction, workmanship and number of centers. An arch is built up in curved shape to transmit load from above to supports (pier or abutment). Full Circular Arch – It is just complete circle. • It belongs to the elementary type of arch that is specifically designed for buildings in which Centre of arch is positioned underneath the springing line. • In this type of arch, the thrust is delivered to the inclined direction to the abutment. The shape of arch curve appears to be semi-circle and the thrust transmitted to the abutments is flawlessly toward the vertical direction because skewback is horizontal. In this type of arch, the Centre is situated accurately on the springing line.